Many people associate apps almost solely within the domain of gaming and useful but quirky accessories such as compasses; however we know that is far from the case. Given the power now available in portable devices such as tablets, phablets, and PDAs, it was only a matter of time before serious business apps would be developed to capitalize on the functionality and portability of these devices. CAPI (Computer-Assisted Personal Interviewing) apps have been developed to help businesses keep in touch with their clients, build strong client relations, and use the information gathered as the basis of future business decisions. By overcoming the numerous disadvantages inherent in traditional survey techniques such as phone and door-to-door surveys, a CAPI survey is the perfect app for gleaning relevant client information. SurveyToGo is a CAPI survey app offered by Israel based Dooblo.net. Israel is a powerhouse in the software and app field so SurveyToGo has much to live up to. Let’s see if it maintains the high standards of the Israeli software industry. SurveyToGo is quick and easy to download and launch. The UI is user friendly and intuitive with all the features available either via the tool bar file menus or in the left pane. Setting up a survey is very easy. There is an extensive range of question types and creating questions with answers is a fast and innate process. Once configured it is easy to check and edit the survey. No matter how simple or complex the survey, SurveyToGo handles it with aplomb. 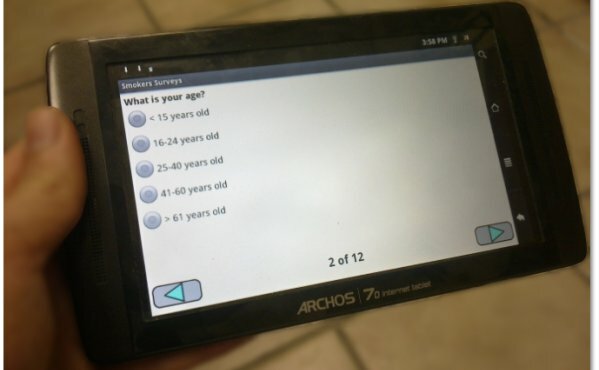 Inclusive in the SurveyToGo functionality are such advanced features as looping, random rotation of questions, using survey logic to skip or filter questions based on previous answers. Running a survey is as simple as logging in, selecting the survey, and running it. Options for analysis of survey results are extensive with export options also available. It seems as though Dooblo have thought of virtually everything in the domain of CAPI surveys with GPS location tracking, centralized project tracking capabilities, multi-language support, the ability to capture bar codes and QR codes in surveys, state-of-the-art security features, the ability to incorporate all sorts of attachments including video, photos, and sound recordings, and the ability to run surveys offline. It goes without saying that SurveyToGo supports Android, Windows Mobile, and Windows XP/Vista/7. This feature list is by no means exhaustive. So what haven’t Dooblo thought of in the creation of SurveyToGo? I cannot think of anything. Perhaps we should create a quick survey and find out.